Dani in unique market area near front entrance! 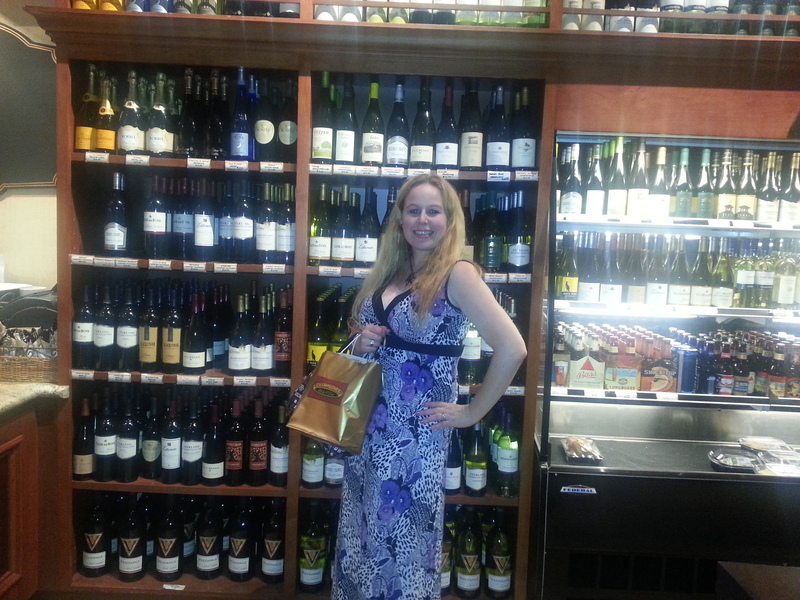 Wines galore!! 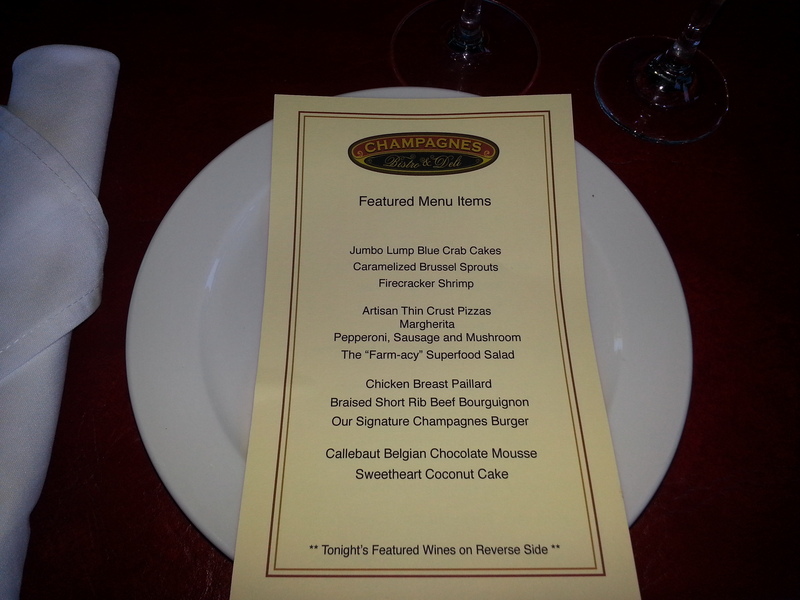 I was fortunate enough to recently attend a dinner event at Champagnes Bistro & Deli in Newport Beach this past week. I had the opportunity to sample their new dinner menu on their garden patio lit up with cute twinkling lights and a welcoming atmosphere. I had never eaten at Champagnes prior and I was very excited to try their menu. Our features specials from the new menu! 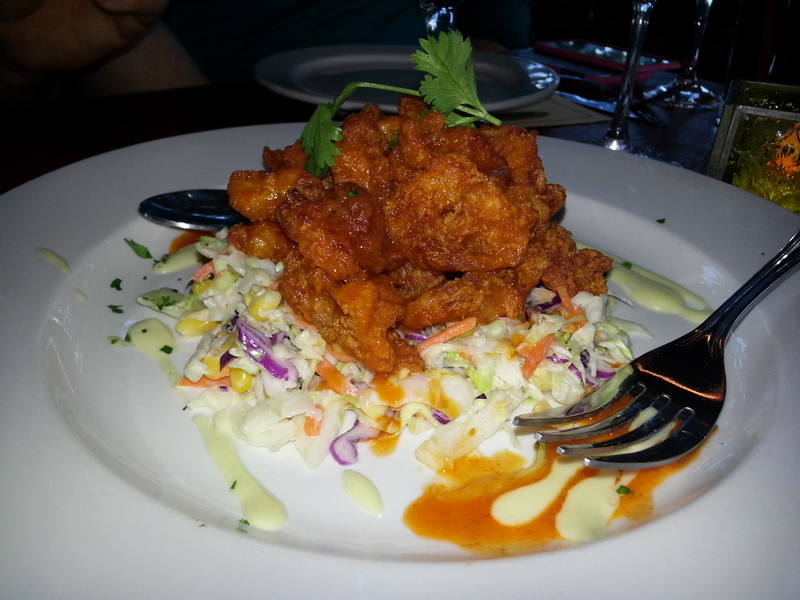 The restaurant is family owned and had been in the same shopping center off of Bison Avenue in Newport Beach for 23 years. 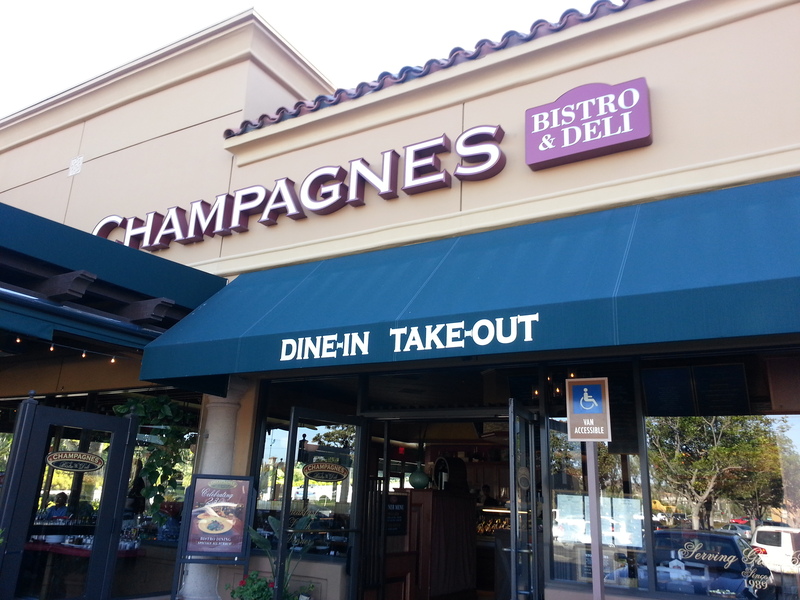 Champagnes recently relocated within the same parking lot to a larger space and decided that they wanted to start a dinner menu. Our night started off with a nice crisp and refreshing glass of Zonin Prosecco that I found to be quite light and fruity on my palate. The bubbles were a nice starter before getting down to business to embark on a four course culinary adventure. I love blogging about companies that offer great deals on food, services, and travel and Champagnes was an exceptional experience so I will share more below about their food items and why they are such a great deal. Our first course consisted of Jumbo lump blue crab cakes, caramelized brussel sprouts, & firecracker shrimp. I must say, I am never a fan of brussel sprouts, never when I was a child and never as an adult. My husband has recently tried to cook them for me and even with his excellent culinary talents, I have never been impressed. Although, for the first time in my life I enjoyed the brussel sprouts at Champagnes. There was some type of rocket science in this recipe because they literally melted in my mouth as I devoured them! 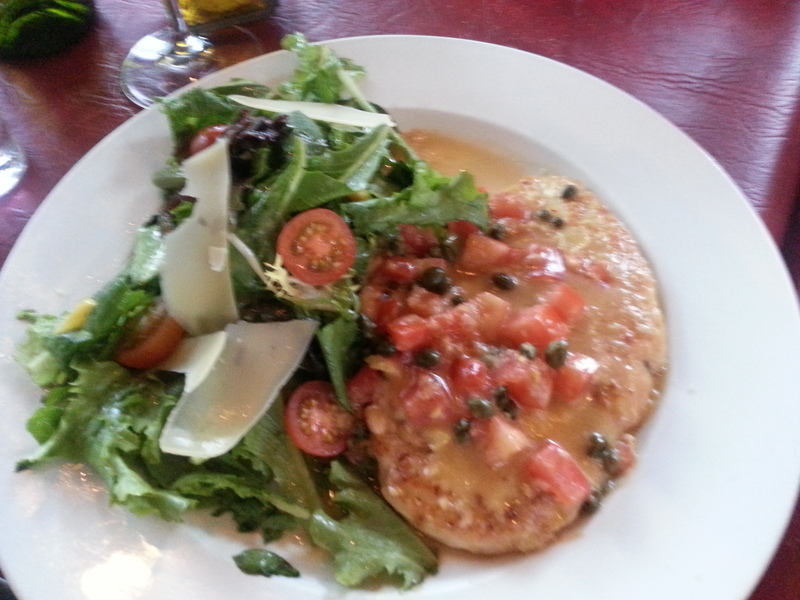 They were very flavorful and buttery with garlic & lemon flavors tingling on my tongue. My second favorite item in this first course was the crab cakes. 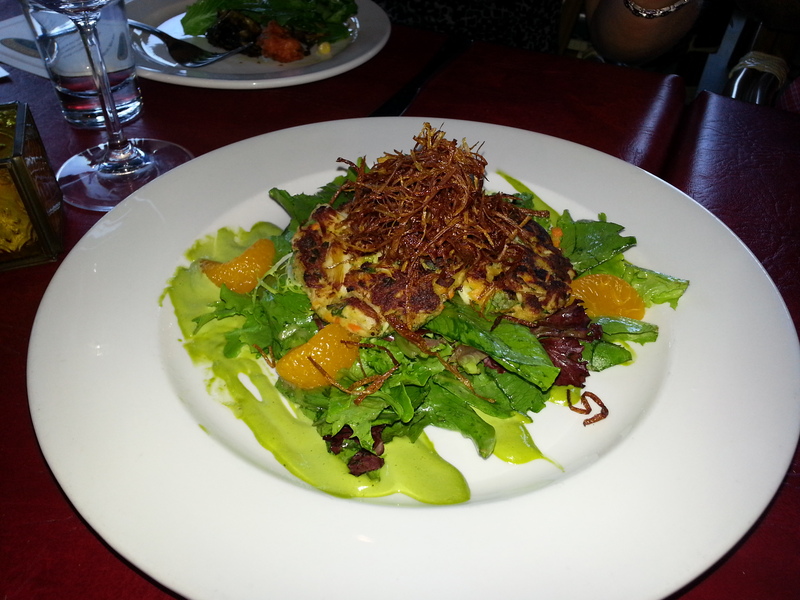 The crab cakes were delicious on a bed of lettuce with mandarin oranges, basil aioli, and leeks. Yum!!! little intense for me, so I was not able to eat much of this dish and I of course had to save my appetite for the three other courses to come. I know my husband (he loves spicy foods) would have probably loves this dish the best and everyone else at our table did too. Our second course consisted of two kinds of pizzas and one salad. We were served two artisanal thin crust pizzas, one being a Margherita style and the other being pepperoni, sausage and mushroom. 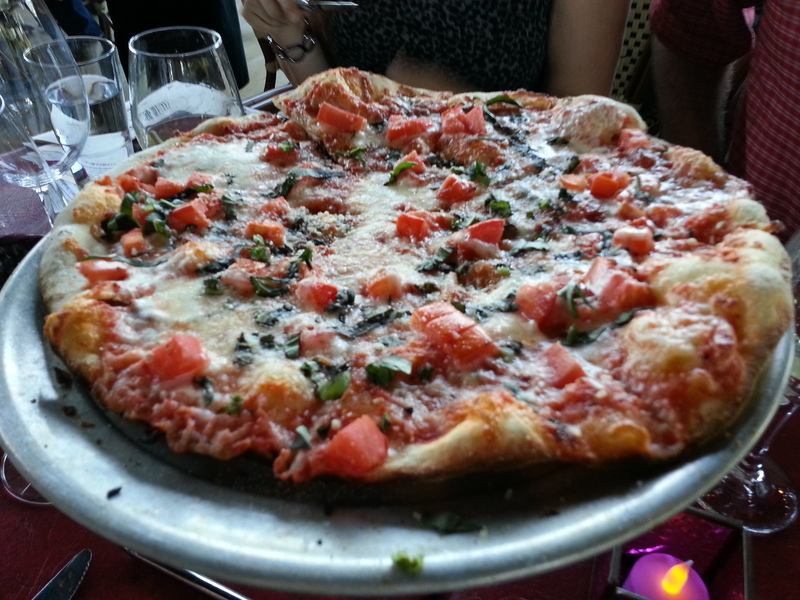 I absolutely loved the margherita style pizza. It truly reminded me of September 2003 and the time I spent with my husband in Italy. 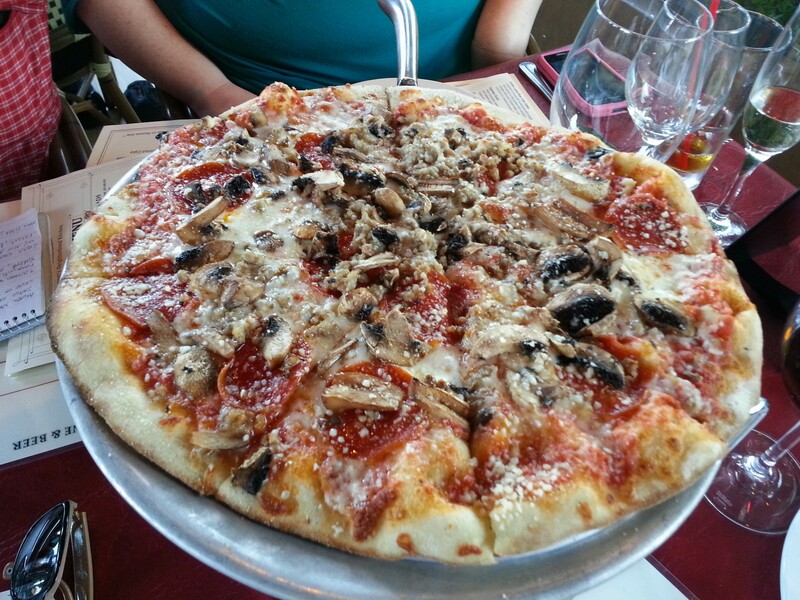 When we were in Rome, we were all about never-ending thin crust pizzas and fabulous Italian Chianti wines…This pizza literally brought me back to the Piazzas in Italy and the sights and sounds of the city. Memories…. :) I don’t eat pepperoni or sausage, so I don’t think my review would do that pizza justice but from the reaction of my friend, Lola who was sitting next to me devouring the warm, moist goodness, I would say the meat pizza was pretty fabulous as well. 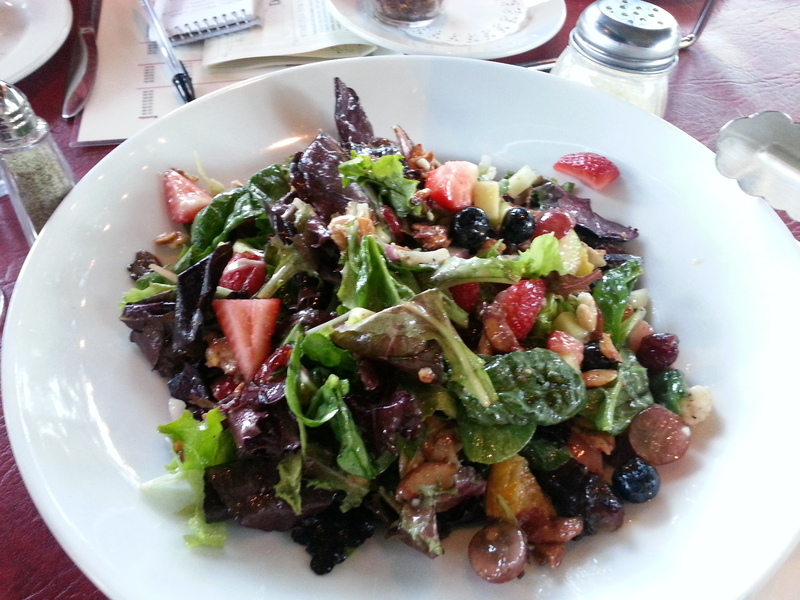 The salad we had was called the “Farm-acy Superfood Salad” and it had many fresh plentiful ingredients which included mixed greens, organic spinach, strawberries, blueberries, red grapes, apple, oranges, dried cranberries, celery, red onions, cucumbers, spiced almonds, blue cheese and orange champagne vinaigrette. This salad was refreshing and was perfect for the summer time weather we have been experiencing in sunny Southern California. For our main course we were served Chicken Breast Paillard (my personal favorite), braised short rib beef bourguignon, and the signature Champagnes burger. All of these selections were quite mouth-watering and delectable. My two favorites were the chicken which was quite moist and had delicious flavoring and a lovely side of roasted veggies and the signature burger which featured an Angus burger with caramelized onion & roasted garlic aioli. 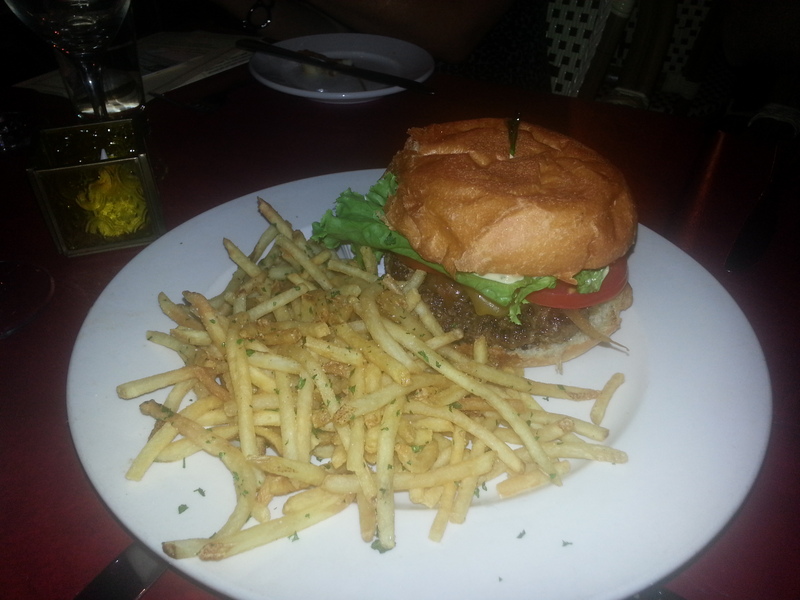 This burger was so juicy that most of the ingredients wound up all over my face and I was loving it! Belgian chocolate mousse and a sweetheart coconut cake. Both of these deserts were phenomenal. I cannot say that one was better than the other, it would simply depend on if you have a hankering for chocolate or coconut. 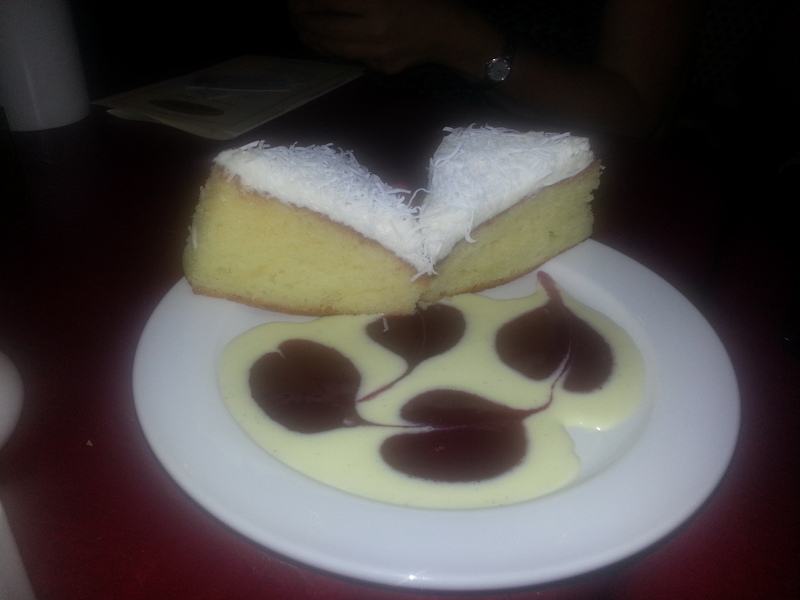 The presentation of the coconut cake completely blew me away in that there were hearts swirled out of raspberry sauce on the cake plate with creme fraiche to top it off! YUMM!!! 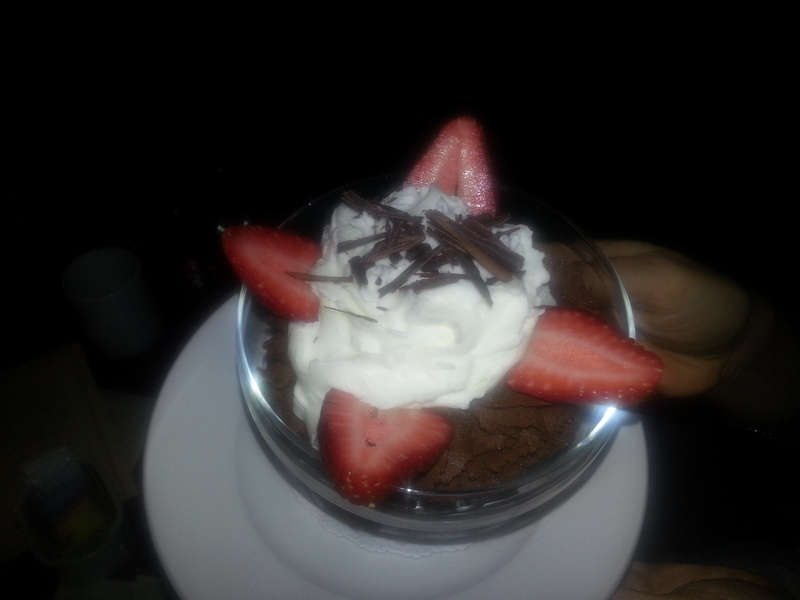 I loved these deserts and will definitely order both to share when I go back to Champagne. costing $4.95 and the most expensive entrée salad being the Classic Cobb Brown Derby Salad at $11.50. Meats can be added for a few dollars more to salads that don’t have meat. 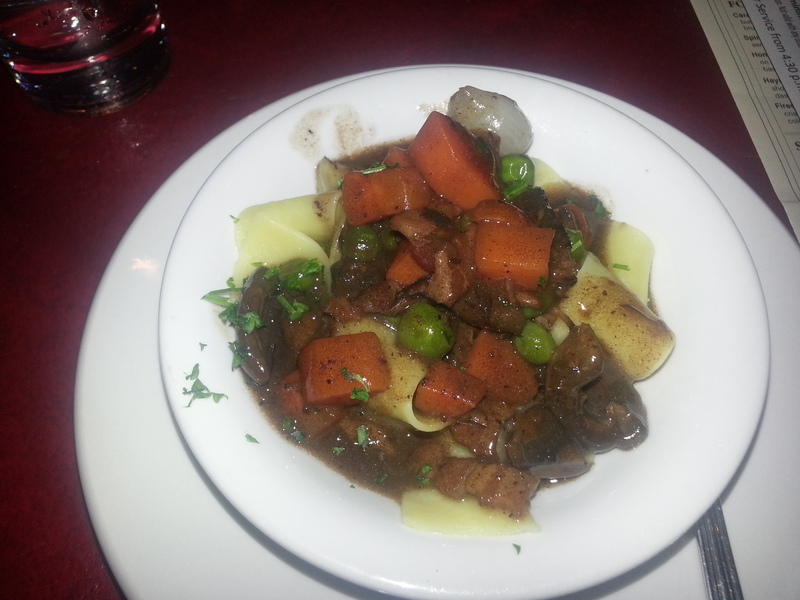 Entrees range between $9.50 for an herb roasted veggie sandwich and the most expensive entrée at $18.95, which was the Braised Short Rib Beef Bourguignon. Champagnes also has a unique market upon entrance to the restaurant where you can purchase freshly made deli sandwiches when on the run, as well as an extensive variety of different bottles of wine that are available for purchase. A new feature coming soon to Champagnes will be an order online selection in order to expedite an order quickly for pick up.In order to promote Champagnes new dinner menu, there are awesome cards you can receive upon dining for breakfast or lunch at their establishment that give you an opportunity to receive $10 off a dinner service with a minimum purchase of $30. This offer is a great deal, but make sure to visit Champagnes for breakfast or lunch soon because this offer expires on August 15th! Go to Champagnes’ website to sign up for their e-club to receive more special announcements and offers directly to your inbox in the future. 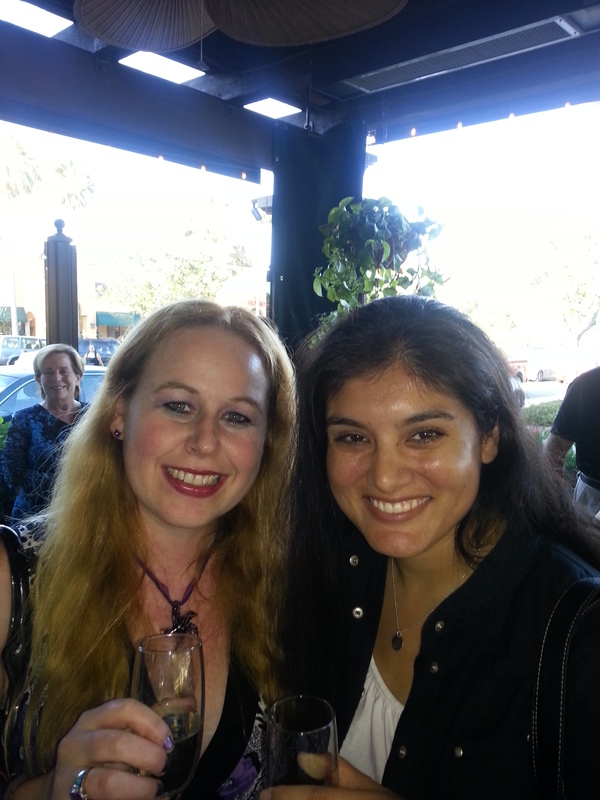 I will definitely be frequenting champagne again soon. Enjoy!! Previous Previous post: OC Fair Deals and Yummy Fried Goodness!!! 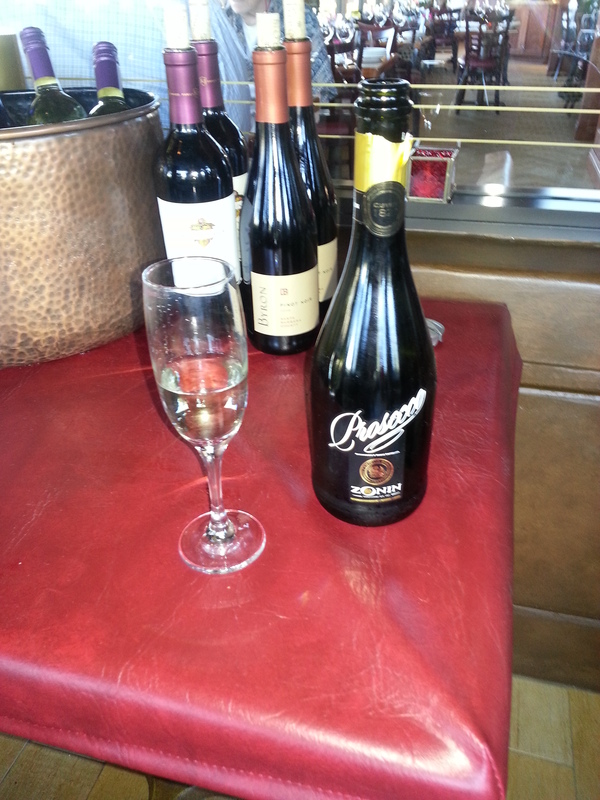 Prosecco is always a good start! 🙂 This sounds like quite an experience, Dani. I like the idea of the “farmacy” salad, too. WOW! Great post and pics and info! You always share such great post. Thank you. wow, great pictures of that yummy looking food. Thanks… now i am hungry and they are too far from me lol. As usual the food looks yummy. Thanks for another great article Dani. You are welcome Meryl:) I hope you are having a nice night! Wow, Dani, I was full just READING about all that wonderful food! I would imagine there were three of you eating together? Looks like an awesome place Dani – the food looks amazing. 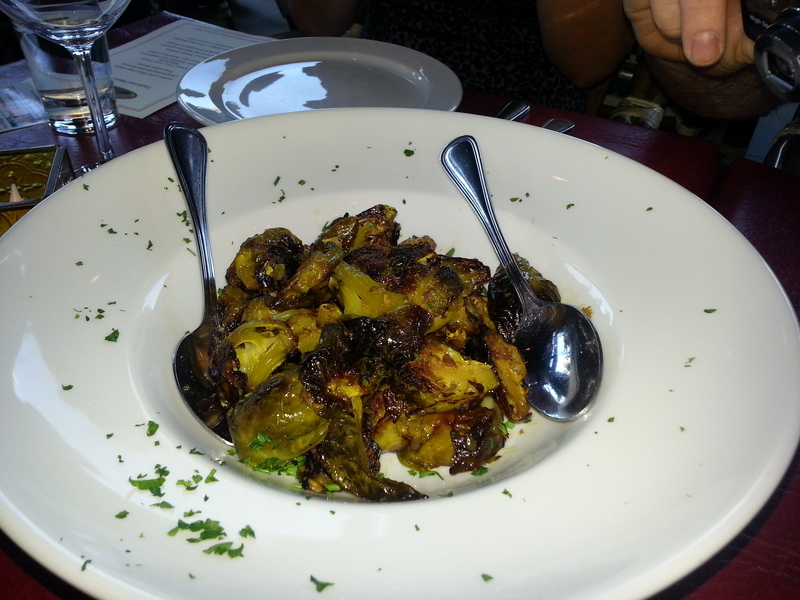 I love crab cakes too but I was intrigued at what they had done to make the Brussel Sprouts so yummy. Okay, now I’m hungry! I love brussel sprouts the way my boyfriend prepares them. I call them Heaven on Earth. I can relate to your post Dani! Thank you. You so often make me hungry with your posts. Looks like amazing food. Thanks for sharing. “Farmacy” salad… great concept. How in the heck do you stay at your weight? I would so not if I followed you! Tee-hee…. Great post, Dani! The Farmacy salad sounds great! What a great review and the photos look amazing. If I’m ever in Newport Beach, I will definitely look this up. The veggie pizza looks delish!!! Oh yes!! 🙂 Everything there is so yummy! The photos of the food looks appetizing! Seeing the photos, the food must have been very delicious. Thank you for sharing.